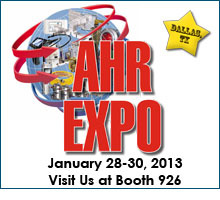 December 2012 - Visit Contemporary Controls in booth 926 at the AHR Expo January 28-30, 2013 in Dallas, Texas. We'll be showcasing how to complete your BACnet project with solutions that take you from device to the Internet using Sedona controllers, BACnet routers, Modbus to BACnet gateways and graphical interfaces. Wired & wireless IP routers and Ethernet switches complete the connection. "The BASautomation product line has several new products that help system integrators make a complete, integrated system that is cost effective," said Joe Stasiek, Sales Manager. On display at AHR 2013 will be the BASview, a stand-alone, embedded, web-based graphical interface for building automation and process automation systems. BACnet/IP compliant, client features include animated graphic screens, scheduling, historical trending, runtime accumulation and alarm monitoring. Sample screen shots and an online demonstration are available on the BASview product page. "The BASview is ideal for small to medium buildings," said Joe Stasiek. "It has an easy to use graphical interface with no licensing requirements." Also on display will be the BASgatewayLX, which makes it simpler to connect Modbus networks to BACnet/IP. "The BASgatewayLX connects BACnet/IP Ethernet to non-BACnet compliant networks such as Modbus Serial or Modbus TCP. Using the concept of virtual routing, up to 30 Modbus devices appear as individual BACnet devices. Using web pages and a resident database of common Modbus device profiles, Modbus registers can be mapped to BACnet objects. "With the cooperation of Modbus device manufacturers, we've developed a library of Modbus device profiles that reside within the BASgatewayLX," said Joe Stasiek. "Having the library removes a significant burden from the system integrator commissioning the system. If we do not have the profile for your device, we will develop it for you." Custom device profiles can then be uploaded. Finally, be sure to see our BAScontrol20, a 20-point field controller with a direct connection to an IP/Ethernet network. Ideally suited for structured wiring systems, the BAScontrol20 is BACnet/IP compliant with a B-ASC device profile. Having a resident Sedona Virtual Machine (SVM), the unit is freely programmable using tools such as Niagara Workbench or Sedona Workbench. For remote Ethernet I/O applications, the unit can be configured with minimal effort using a web browser. The BAScontrol20 provides a convenient mix of universal inputs, binary inputs and outputs as well as analog outputs. Models exist for both triac and relay binary outputs. The unit is ideal for unitary control or for expanding I/O points in the field via an Ethernet connection. We're looking forward to seeing our existing customers and meeting new ones. Be sure to stop by booth #926 to say hello.